The Science program at City and Country has four central goals: the development of higher thinking skills, practice in methods of scientific inquiry, the teaching of specific science-related information, and the strengthening of students’ understanding of science concepts in relation to social studies content and the Jobs Program. The Science program supports and enriches the Social Studies curricula through the intensive study of selected scientific and technical concepts. Along with exposing children to the fundamentals of biology, chemistry, engineering, earth science, astronomy, and physics, science labs help them more deeply understand and experience the time in which a discovery was made and the people responsible for making it. The Science Teacher schedules visits to the Lower School classrooms in order to answer questions that come up as the children work and to lead the children in simple experiments. Students begin attending science in the 7s with one-hour classes per week, where they participate in sensory-based exploratory labs that are generally based on a station teaching model that allows groups of students to explore different avenues of an area of study simultaneously. One highlight of the 7s science curriculum is the engineering-based exploration of arches and the strength of certain shapes, in preparation for their building a model truss bridge. 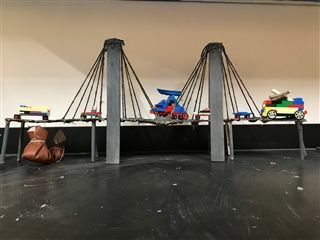 This is the beginning of their bridge study, which is continued throughout their time at C&C. 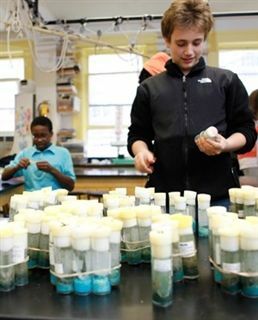 The 9s science curriculum is centered around lab activities that engage the students in using the metric system to explore mass, volume, density, and displacement. This is also the year when students go on their Country Trip, so in preparation for it, they study food chemistry through activities such as making butter where they can observe the suspension of lipids, and botany. From the 10s onward, students have one-and-a-half-hour science classes per week. 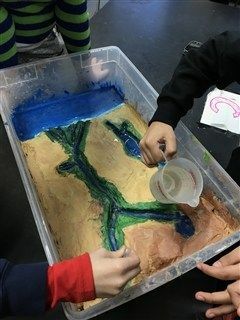 In connection to their study of ancient civilizations in Egypt and Mesopotamia, the 10s examine river valleys in grassland and desert habitats, and build and flood their own terrain maps of the Nile River Valley and the Tigris/Euphrates River Valley as a culminating project each fall. Sustainability is a common thread in Upper School science. The 11s study New York City’s relationship with waste and the methods which the city employs to transport garbage and recyclables. The 11s culminating activity is to create action plans to reduce C&C’s carbon footprint. The 12s build on their prior knowledge of physical science from Middle School to examine the layers inside of the Earth and how, and why, they exist in different states of matter. One topic of study is an investigation of volcanism around the world, with case studies in Greece and the Hawaiian islands. At the end of their study, students build and erupt a scale model of a volcano, reflective of the lava viscosity of the type of volcano they chose. For the 8s to the 13s, Afterschool science classes offer students the chance to continue their work on a science-related endeavor or experiment with new materials under the supervision of a Science Teacher. Afterschool is also a space for ongoing and evolving sustainability work that affects the entire community. Recently, older students have teamed up with the staff Sustainability Committee to continue efforts to cultivate understanding about sustainable practices and implement sustainable acts among the student body.